There is no good war. ... a war always ends. The class war is over. The war is in our souls. 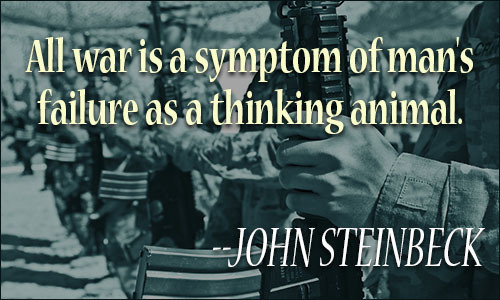 The root of war is fear. Im Anfang war das Licht. Boys are the cash of war. Im Anfang war der Rhythmus. This war on terror is bogus. I'm in a war, a cultural war. Art should be waged like war. You want one civil war, brah? I am at war with the obvious. It was not war, it was murder. I was against the war in Iraq. A poet must learn to wage war. None of us wants any more war. It is not a war. It is murder. I voted to send people to war. I think war should be illegal. The war in Iraq was unwinnable. 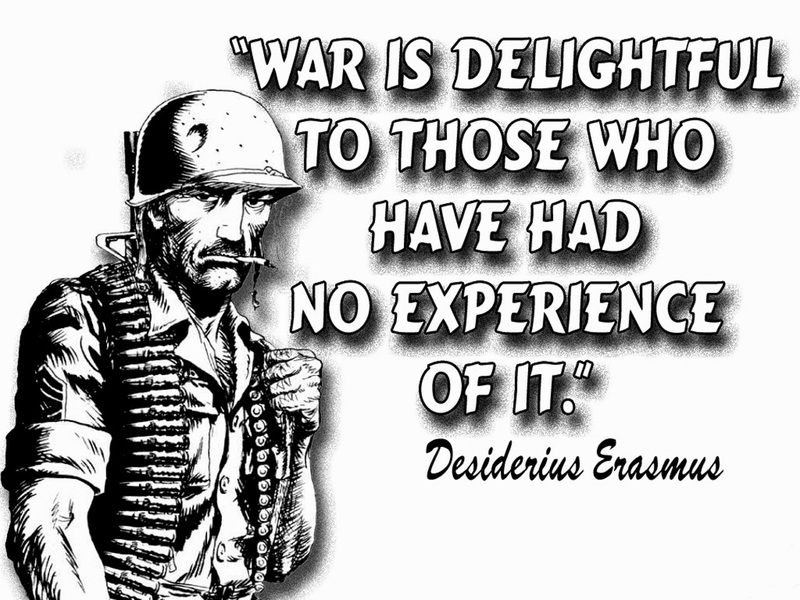 And war-the worst form of evil! In war everybody is a prisoner. I was trying to disturb the war. If we have to go to war, we will. Peace is more difficult than war. I think I was unprepared for war. Vladimir Putin is a war criminal. We ain't goin' study war no more. In war, only the simple succeeds. My parents created their own war. Wage war on death. Live for love. Those who prepare for war get it. If you want peace, understand war. I wouldn't go to war over Ukraine. I didn't start a war. Nobody died. Advise none to marry or go to war. ...Israel is run by war criminals. The Germans, a race eager for war. I will not dance to your war drum! Victory is the main object in war. It takes a fool to rush off to war! Whatâs so civil about war anyway? Today is a good day for war to end. When war begins, then hell openeth. Near a war is always not very near. 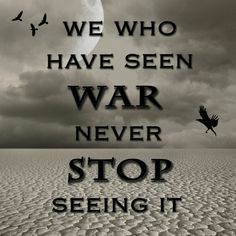 We must end war before war ends us. Every war is a national misfortune. You can't have peace without a war. It's magnificent, but it's not war. There's never any guarantee at war. 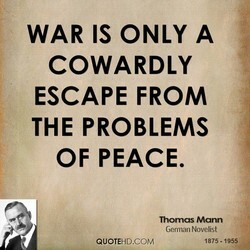 The true objective of war is peace. Love between a man and woman is war. We were always dead against the war. I'm an indestructible master of war. First casualty of war, is the truth. The war has ruined us for everything. Let's forgive the Nazi war criminals. When war is raging the laws are dumb. 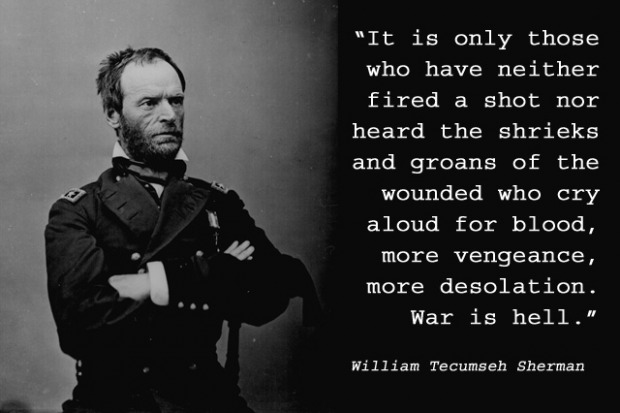 Every US President has to have a war. The threat of a world war is no more. The nature of war is constant change. [Nuclear war]... may not be desirable. In war, one cannot say what one feels. The war brought out all the art in me. Would you end war? Create great Peace. It is with artillery that war is made. In a war the aggressor sets the rules. Lose this battle so we can win the war. Supporting war initially was a mistake. I make war on the living, not the dead. Iraq was a war of choice, like Vietnam. Nobody dislikes war more than warriors. Cloath thee in war, arme thee in peace. It is war now, and armies need symbols. 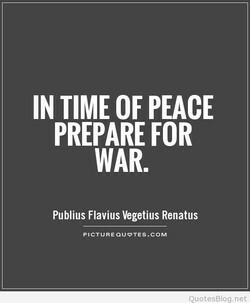 If you want peace, prepare for the war. Peace is impossible, war is improbable. Iraq was a war of choice, not necessity. He who wants peace must prepare for war. How sweet war is to such as know it not. 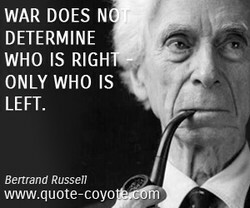 In war, is it who's right or who's left? Talking jaw is better than going to war. A world without war is not in the cards. An organism at war with itself is doomed. 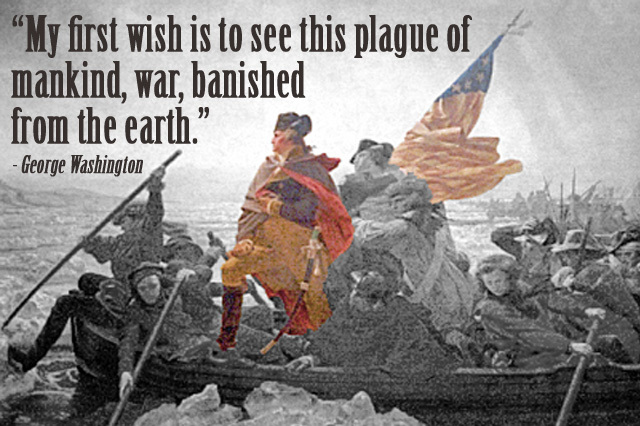 A great country cannot wage a little war. I don't know if anyone ever 'wins' a war. Suppose they gave a war, and no one came? All's fair in love, war and ride-sharing. I know of nothing more exciting than war. The first casualty in every war is truth. In war, discipline can do more than fury. Truth is always the first casualty of war. The paparazzi are nothing but dogs of war. Only the defeated and deserters go to war. Luxury destroys more efficiently than war. When people go at war they cheapen things. It is cruelty in war that buyeth conquest. Waging war is not a primary physical need. 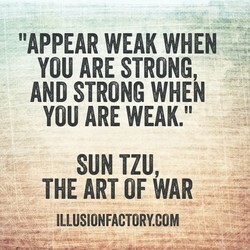 The power of making war often prevents it. In war, truth is often the first casualty. Der Vietnamkrieg war ein Verbrecher-Krieg. In war, everyone has their chance to bleed. What if someone gave a war and Nobody came? A severe war lurks under the show of peace. The drug war is a holocaust in slow motion. We must conquer war or war will conquer us. Freedom is often the first casualty of war. We are trying to prevent a third world war. It's not victory if it doesn't end the war. Only the dead will know the end of the war. War on the cheap is always a rotten policy. Nur wer allein war, kann mit anderen gehen. A political war can be fought from anywhere. I prefer law to war under all circumstances. One makes war to win, not because it's just. In war the simplest manoeuvres are the best. War brings out thieves and peace hangs them. Love's Pestilence, and her slow dogs of war. Selfishness is unnecessary. War is obsolete. Belligerents always abolish war after a war. Winning is only important in war and surgery. Unfitness for war is unfitness for existence. When you smoke (ganja) you don't want to war. A war is not lost until you consider it lost. War is the only proper school of the surgeon. I am well versed in reading the pages of war. This ain't a war... It's a goddam whorehouse. Barak Obama initially opposed [war in Libia]. The War will leave none of us as it found us. In war, bullets; in love, deceptions kill us. The secret of war lies in the communications. Nothing is more important than to war on war. 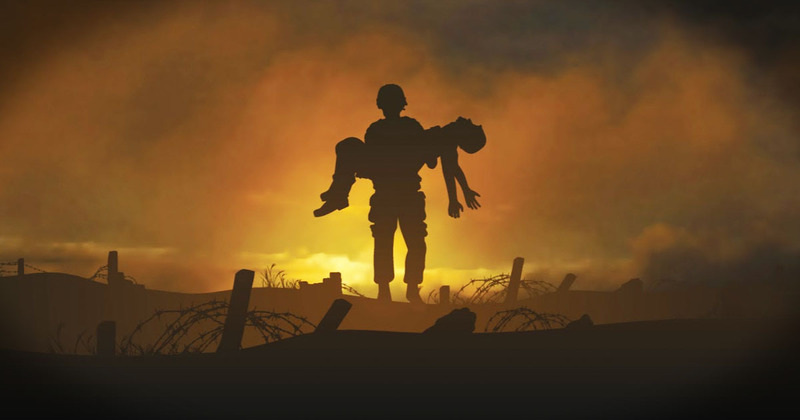 There's only one truth about war: people die. Instead of tug o' war, let's play hug o' war. To win a war is as disasterous as to lose one. Every war is different. Every war is the same. He [John McCain] hit me - he`s not a war hero. Peace means far more than the opposite of war. When war comes, reason is regarded as treason. War should always be the absolute last resort. War: that mad game the world so loves to play. 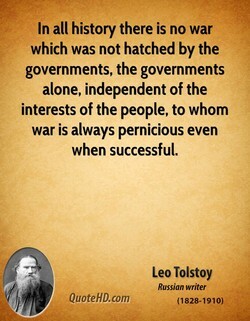 War is just to those to whom war is necessary. It's always been my dream to be in a war film. Iraq war has made us overlook domestic agenda. His heart, the war. Her face, the battlefield. Your war drum ain't / louder than this breath. War is the only game in which both sides lose. War's Legitimate Object Is More Perfect Peace. There is no room in war for delicate machinery. 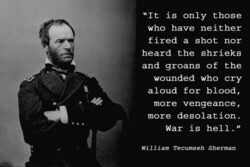 America, like all nations, has to renounce war. The war existing between the senses and reason. If God is on our side, he'll stop the next war. A good front is half the battle in love or war. War, sometimes you have to go for it, you know? War taught me that not everything is glamorous. War is a crime which involves all other crimes. He who wishes to be a surgeon should go to war. We are not at war (except with our own demons). In war trivial causes produce momentous events. Free speech is a great idea, but were in a war. A foreign war is a lot milder than a civil war. We can't win a war, but we can win an election. In any war who pulls their general out? No one. 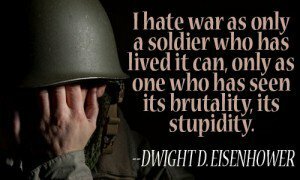 I've seen firsthand the high human cost of war. In Europa gab es erst Frieden, als es frei war. 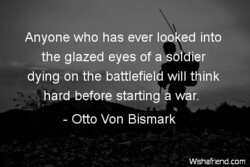 There' s nothing good in war. Except its ending. War that I have anywhere in my life should stop. In war, we always deform ourselves, our essence. The only war is the war against the imagination. Passitivity and quietism are invitations to war. War is the most readily available form of chaos. 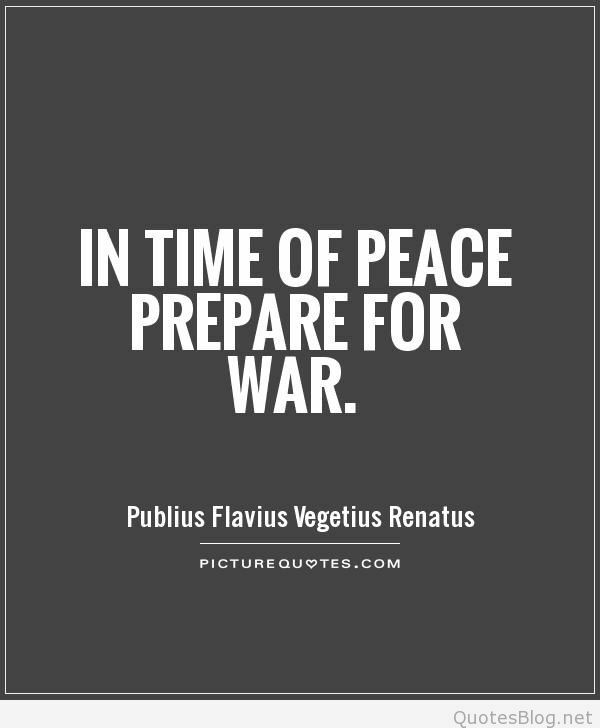 In peace, a wise man makes preparations for war. Sweet Jesus, war does terrible things to people. You burn a man's pickup, and he's ready for war. Luck rules every human endeavor, especially war. War is a highly overrated tool of foreign policy. Two things are always the same the dance and war. My, how beautiful is war! its songs, its leisure! war is not just a victory or loss ... People die. 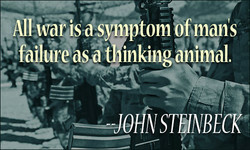 If we do not redefine manhood, war is inevitable. 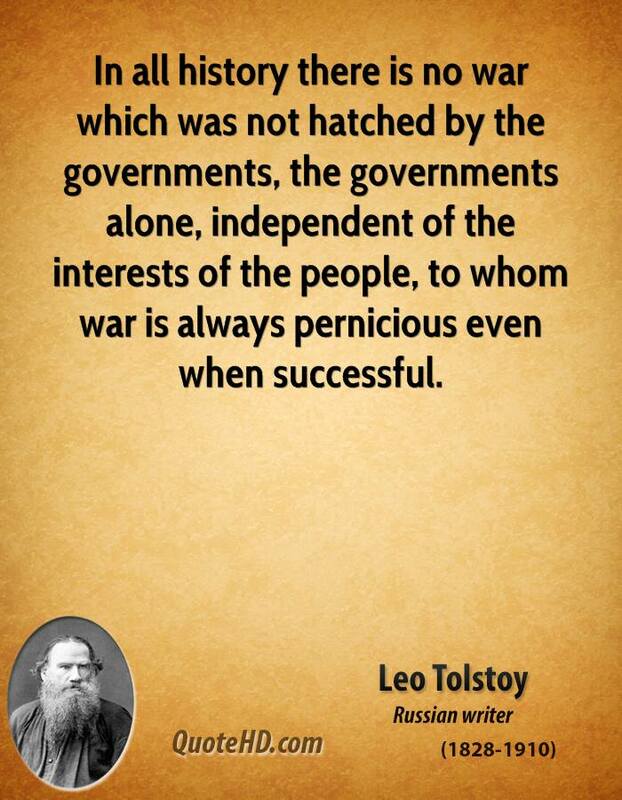 War is a matter of vital importance to the state. We're still eating the leftovers of World War II. man's oldest and least reputable occupation - war. War...seems a mere madness, a collective insanity. War is like night, she said. It covers everything. War is a crime. Ask the Infantry and ask the dead. A wolfe will never make war against another wolfe. No war or battle sound Was heard the world around. I'm battling with myself and every day it's a war. Every war has turning points and every person too. The sinews of war are not gold, but good soldiers. The war in Vietnam is going well and will succeed. No nation has ever benefited from a prolonged war. Once upon a time the plural of 'wizard' was 'war'. Noch nie war einer glücklich, welcher unrecht tat. Never start a war with something you can't talk to. War is...a trinity of violence, chance, and reason. Dying in a a war never stopped wars from happening. Success in war depends upon the golden rule of war. If the dead could speak there would be no more war. Proof of war, when it comes, always comes too late. There is no nation in the whole world desiring war. War, war is still the cry,-"war even to the knife!" We've been at peace about as long as e were at war. Genocide is not war! It is more dangerous than war! How mad it is to summon grim death by means of war! Politics is a war of causes; a joust of principles. Leave war to others; 'tis Protesilaus' part of love. Three cheers for war, noble and beautiful above all. Hating war in Vietnam in 1965 was minority position. I never believed in the danger of a third world war. Photography can be perceived as the opposite of war. Vote for war allowed war only after all else failed. 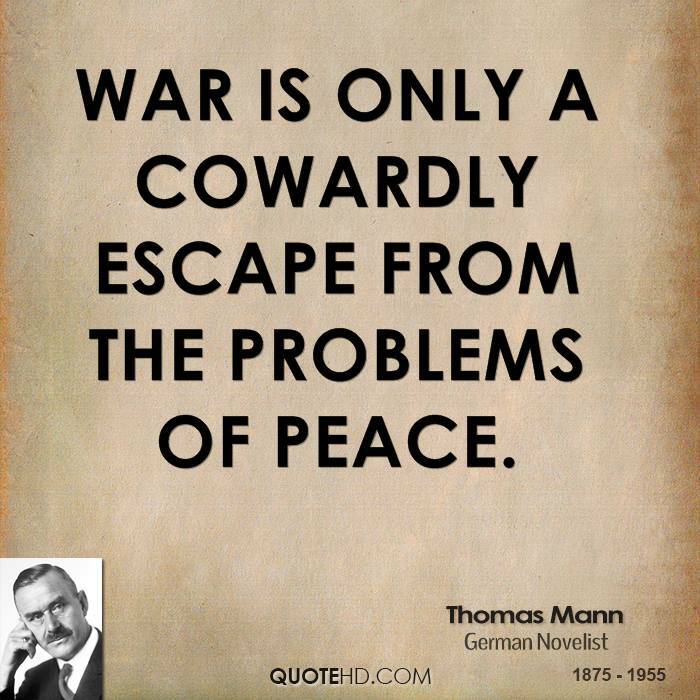 There is no greater guilt than the unneccessary war. To go to war, you must always think of, can you win? In war, important events result from trivial causes. Never again war. Never again hatred and intolerance. We should lay up in peace what we shall need in war. I'm ready to stop waging war and start washing feet. We hear war called murder. It is not; it is suicide. Freedom is not a tea party, India. Freedom is a war. 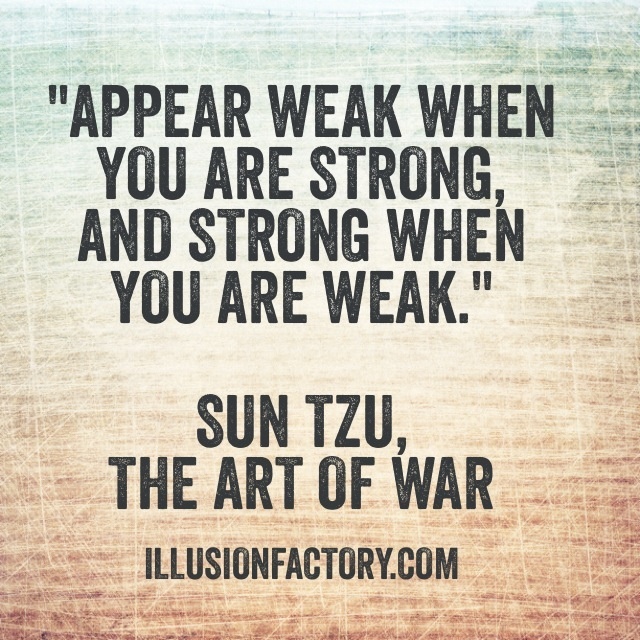 In war, practice dissimulation and you will succeed. Ich war erfolgreich, weil ihr an mich geglaubt habt. Viewed as a drama, the war is somewhat disappointing. Now I see Peace to corrupt no less than war to waste. The cold war is over, but cold war thinking survives. As in laws or in war, the longest purse finally wins. War is only an invention, not a biological necessity. Ronald Reagan won the Cold War without firing a shot. We resist Joy on this planet more than we resist war. There is no life in war; there is life only in peace. Hey, I'm for love, not war. How about we have a beer? Let others wage war. You, lucky Austria, shall marry. 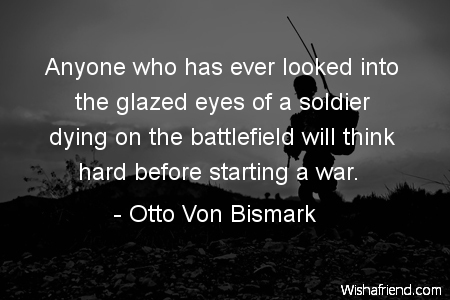 It is the object only of war that makes it honorable. War cannot be abolished unless classes are abolished. 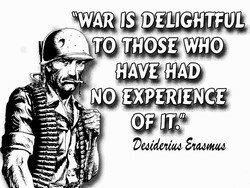 Experience is our only teacher both in war and peace. It is a good face. I am glad this war is over at last. A schizophrenic war is not an easy thing to deal with. 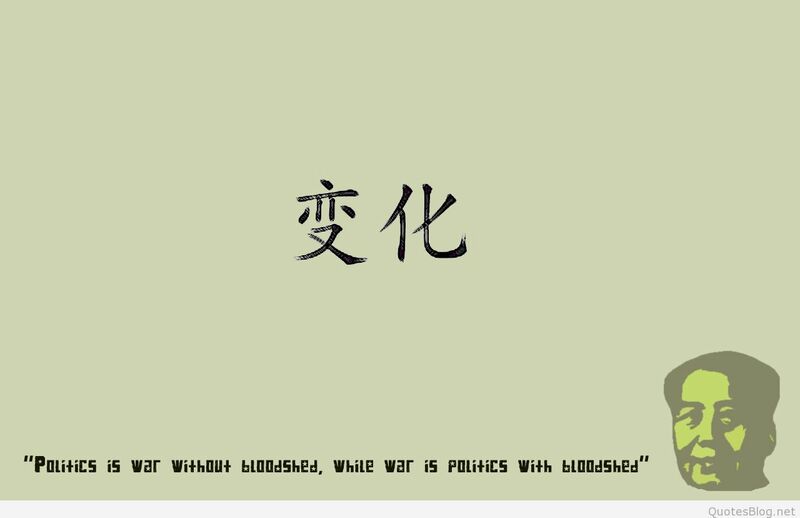 The art of war in its highest point of view is policy. And the ones who would not make war? Can they stop it? 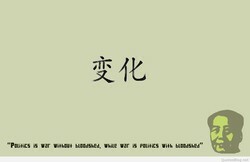 War is a series of disasters which result in a winner. Only a modern army will be able to fight a modern war. There isn't a war on terror, there is a war of terror. Science and peace will triumph over ignorance and war. A toast to the weapons of war, may they rust in peace. Here's my strategy on the Cold War: we win, they lose. Well, all's fair in love, war and fooling the critics. the suppression of war is not the equivalent of peace. Modern politics is civil war carried on by other means.